Some of you are really having a snow storm this weekend, I hope all of you are staying warm and cozy with lots of yummy food. We are busy here at the cottage getting ready for our spring planting with little starter plants in every window, it looks like a green house in here with the hope that spring is just around the corner. Our little Rescue Dog Max thinks that when we dig in the garden he needs to dig as well, he keeps me busy washing his little white feet, we just love our little Max. We have a nice cozy menu planned for next week, hope you enjoy it. I hope that your Valentine Day is very special and filled with love and happiness with lots of good food. Have a fantastic week and thanks for stopping by, come back soon! Hi Miz Helen, I just found you through Pinterest and I've been having a ball browsing through your site! I am a mom of a large family too (6 girls) and LOVE to cook for them. What I really appreciate about your site is that you post full menus! I love to plan menus and it's hard to find others who post more than just one recipe. To me, half the fun is compiling recipes to make for one complete, wonderful meal! Thanks for the wonderful inspiration! I am so glad you stopped by,it is always so exciting to hear from my readers. When you are feeding a large family it is very important to plan and stay organized, as I am sure you know. Hope you enjoy the menus and you have a great week! 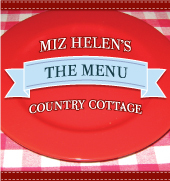 Hi Miz Helen, it looks like another yummy week at your place. Your Salmon with Bacon really caught my eye. I'm always on the lookout for ways of getting more fish in my diet. We just loved this Salmon, it is so full of flavor. I am sure glad I developed the recipe. Thanks for stopping by and see you on Monday at The Secret Recipe Club! You are awesome and I wish I could just send you some of those cookies! Hope you have a great week!